I thought this would be easier than it was.....choosing a favorite photo from a post during each of these last 12 months. I enjoyed looking back over these past 12 months though. Today marks not only the eve of the new year, but also my one year blogging anniversary. 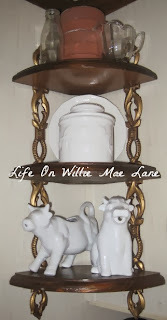 This blog has been like an online scrapbook for me. 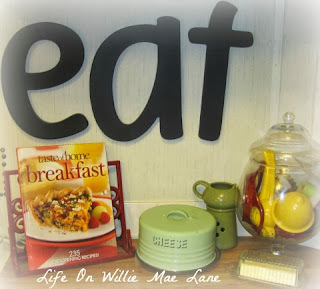 I know I don't blog about anything specific....more about what's currently going on in my life from family events, recipes, thrifty finds, makeovers, crafty projects, pets, and so on. My daughter told me awhile back that our blogs (hers and mine) are lifestyle blogs since we don't stick to one subject. I love that and documenting this last year on my blog makes me wish I could have done this my whole life. 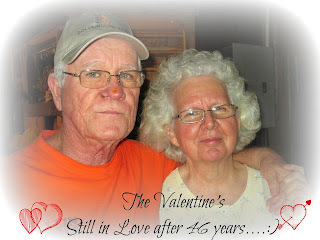 I have tried over the years to scrapbook and keep up with photos but it always overwhelmed me and I would soon give up. I would still like to go back and finish organizing my hard copy photos some day though, but I am so happy to have my blog to keep up with everything now. I am equally glad that I have made so many new friends through this blogging world. I am always so delighted to hear from each one of you. I know if I ever have the chance to meet you in real life that it would be so enjoyable and comfortable, since it feels like I have know some of you for much longer than a year. I thank each of you who follow me and visit often as well as those of you who just pop in occasionally to see what I have been up to. You amazing ladies mean so much to me....and I look forward to sharing the upcoming year with you all. May each of you be blessed with a beautiful 2014! 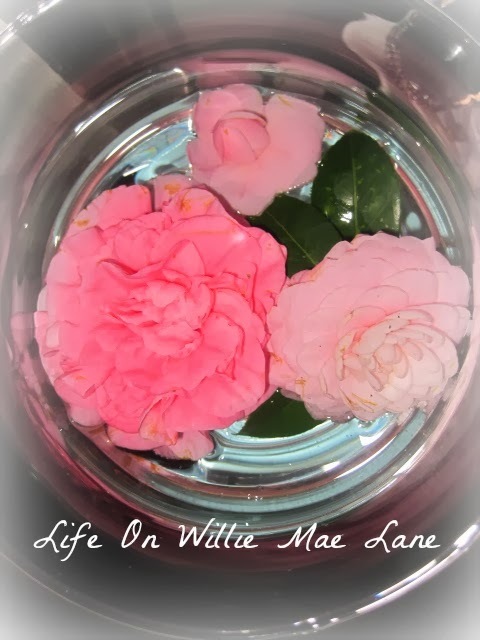 January was my first month of blogging about my life here on Willie Mae Lane. 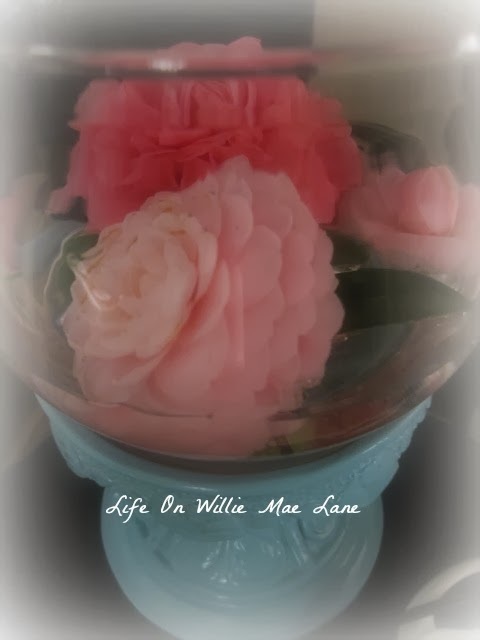 There were no big events going on, but I did share lots of thrifty finds, a recipe, a couple makeovers, and photos from walks down Willie Mae Lane....like this one. February soon came and brought with it lots of treasure hunting, trying my hand at creating vignettes, Valentine's Day, and a trip with the family to one of my favorite local places....Shired Island. Along came March and more thrifty finds, walks with mama, some redecorating, a yummy new recipe, a trip to Tallahassee to see Miranda, and a fun weekend trip with the family down in Suwannee on the Gulf of Mexico. 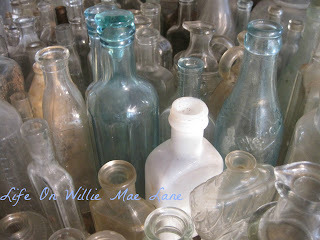 One fun day was spent at mama and daddy's going through all my Granny Valentine's old bottles she dug up over the years. Aren't they pretty? 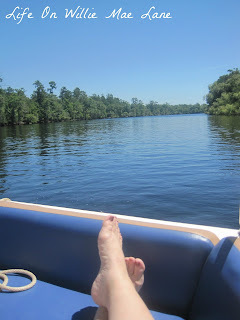 July brought my second favorite holiday...4th of July, and lots and lots of fun! 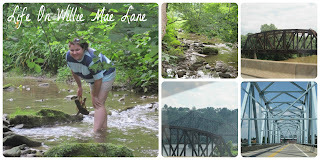 I enjoyed lots of crafting and redoing in July and had my first ever guest bloggers, won my first giveaways, and enjoyed a fun Road Trip with my daughter, Miranda, and mother-in-law to Pennsylvania. August is always a busy month for a teacher.....I posted only 7 times during this month! I did try a new recipe and went thrifting once or twice, but the most exciting thing in August was meeting my new granddog...Sadie. I thought I would also include a photo from the most viewed post of the year as well.....except this isn't really a photo. My Christmas ornament exchange post was definitely my most viewed post of the year! So, since that wasn't really a photo, I am including my second most viewed post....my ice cream table and chairs. I am contemplating selling it since I do not have a good space for it and could use the money I would get out of it to begin my next room remodel. We'll see! 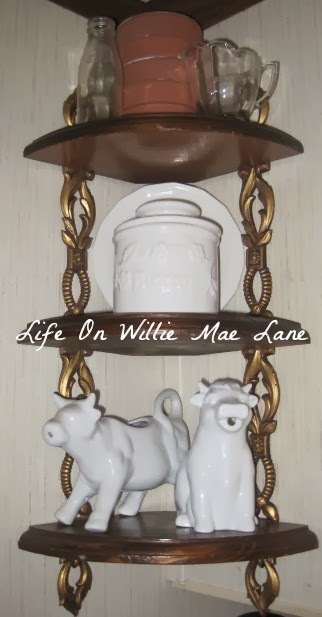 Well, I hope you enjoyed the walk down Willie Mae Memory Lane. 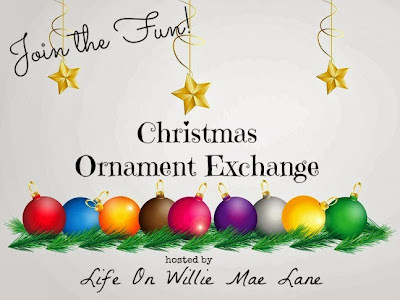 You might have read my last post where I mentioned taking down all my Christmas decor and getting my house back in order. I decided to move a few things around in my kitchen when I put things back that had been packed away for Christmas. 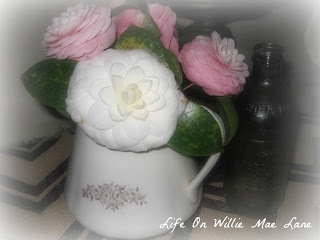 I thought I would share a few vignettes.....nothing spectacular, but they make me happy! First up is this little corner shelf. The shelf and everything on it was thrifted....except the little bottle on the top shelf. My hubby found it at work one day this past year. I love my little butter bell and the adorable cow creamers. I tweaked the area on the left side of the stove a bit and added my vintage cheese dome (a gift from my Aunt Loretta, Christmas 2012). 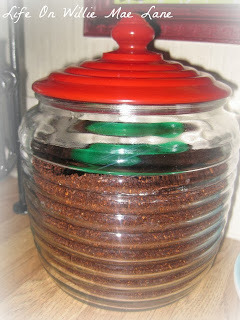 I also moved my large apothecary jar over here as well. It holds various tools....a juicer, an apple cutter, cupcake corer, choppers and biscuit cutter, etc. On the other side of the kitchen is the coffee and snack station. The jadeite cannister on the left holds granola bars and the apothecary jars hold nuts. 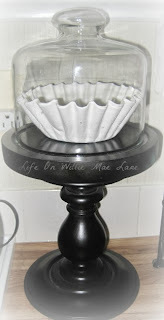 This is one of my favorite thrifted finds...a beehive cannister. It is definitely vintage. This is a piece I created by marrying a cheese dome and plate with a chunky wooden candle stick. I made this a couple years ago and it has been used to hold coffee filters since. 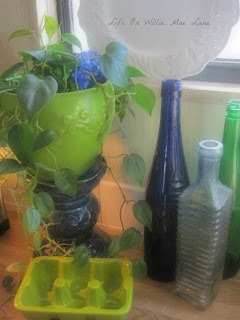 In front of my sink is a plant, ceramic egg crate and a few bottles. I got these bottles for free recently and plan to one day use them outside on a bottle tree. 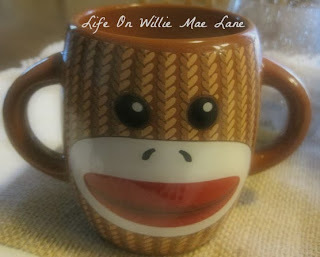 You might have noticed this little sock monkey cup in the coffee station photo above. It was a gift from one of my students...:) He is too cute! I just love his handle ears. 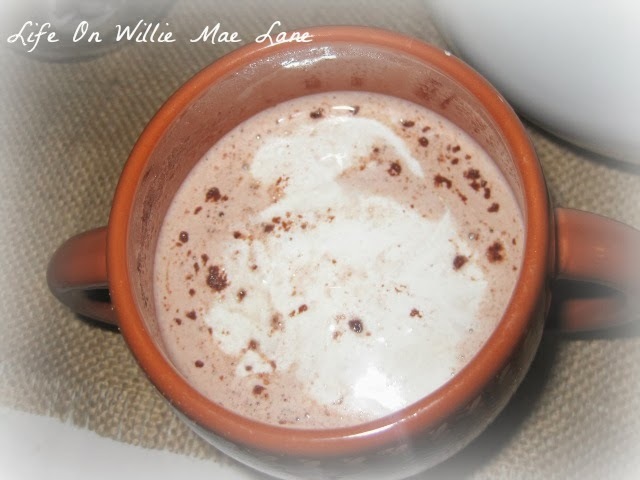 I used it this morning and enjoyed a nice cup of hot chocolate with marshmallow cream. One last thing to share that has nothing to do with the kitchen. The hubs and I went to town earlier to run some errands and he needed to run in Tractor Supply. I normally don't care much for this store, but they always get neat items in for Christmas and I thought they may have something cool left and on clearance. I was right! 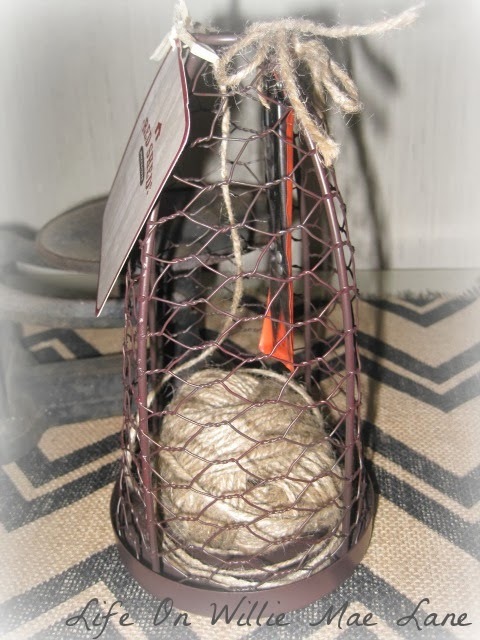 I found this awesome twine holder made from chicken wire. It comes with cutters too. It was normally $9.99, but was 40% off so it was only going to be $6. When it rang up though , it was only $4.59! I was thrilled. I plan to paint it black and of course it will live in my craft room. Best thing is, I bought two of them so I can include the other one in my upcoming one year blog anniversary giveaway! So be sure to keep checking in for details on that. I do hope your Monday was a wonderful one! 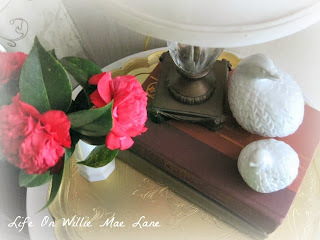 I am excited to share some treasures I picked up on my trip to town today...but that is for another day. Have a blessed week my friends. I don't know about you, but I think I enjoy "undecorating" as much as I enjoy decorating for Christmas. I always decorate during my Thanksgiving break, so everything is up for around 4 weeks to give me time to enjoy it. And....I do enjoy my Christmas decorations so very much. But, as soon as Christmas is over, I am ready to take it all down and pack it up for another year. The house always looks so bare after everything is taken down though, so I had to liven things up a bit. Last night, one of my best friends, my mother-in-law, and my brother-in-law came over for supper and I wanted something pretty...yet simple, on the table. My camelias have been blooming for a couple of weeks now, so I decided to pick a few of mine as well as mama's to adorn the table. 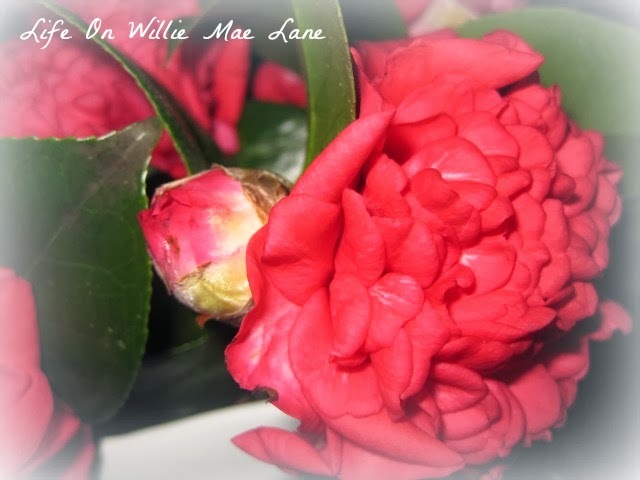 These are from mama's bushes....I don't have any this color....they are almost red and oh so pretty. Just look at all the petals! These are from my bushes. I picked a couple off the ground that the rain had washed off the bush. I just love camelias....they're my favorite flower. I love that they bloom in the winter and liven up an otherwise brown and barren landscape. These are sitting on my buffet. One of the side tables in the living room got a bouquet too...:) How do you like my birds? I got them a few weeks ago for a dollar or two at my favorite consignment shop. 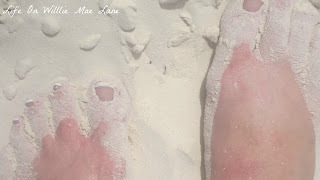 They were already painted white. I love them on my thirfted tray that I repainted gold a few weeks ago. 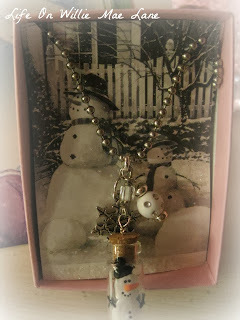 I have been meaning to share this sweet little gift I received in the mail the day before Christmas Eve. Another sweet token from a precious blog friend....Tina from Cluttered Corkboard. If you haven't visited Tina, you need to do so. Not only is she a sweetheart, she is very crafty and creative as well. 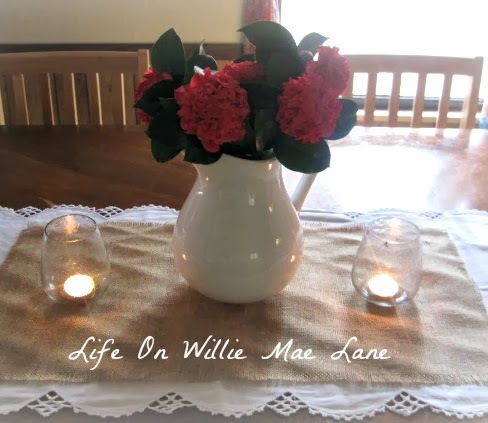 I get lots of awesome ideas from her blog! 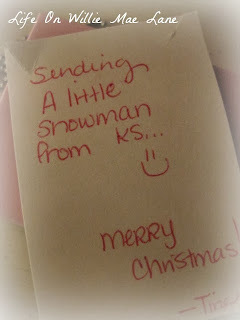 Anywho, she sent me a little surprise in the mail and I was just tickled to open it up! Just look at this adorable little necklace! 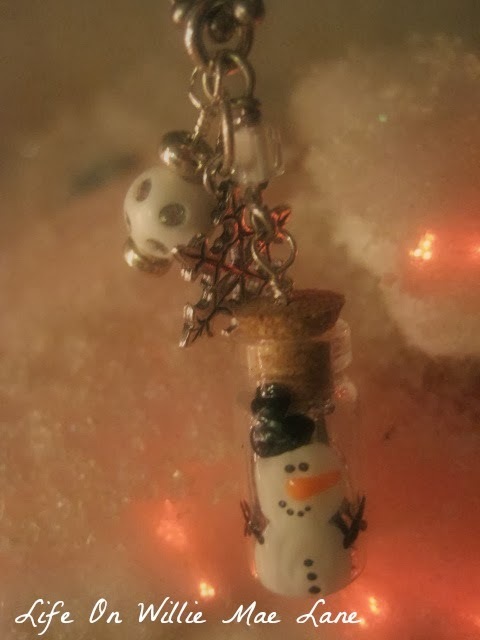 Even the paper it is attached to is just too cute with the black and white snowman image! Have you ever seen such a tiny little bottle with a cork stopper? Just look at the adorable hand-painted snowman and the little snowflake and white bead are the perfect finishing touch! This note was on the back of the paper the necklace was attached to...:) I just love my adorable necklace and I wore it on Christmas Eve and Christmas day. Everyone thought it was just too cute! 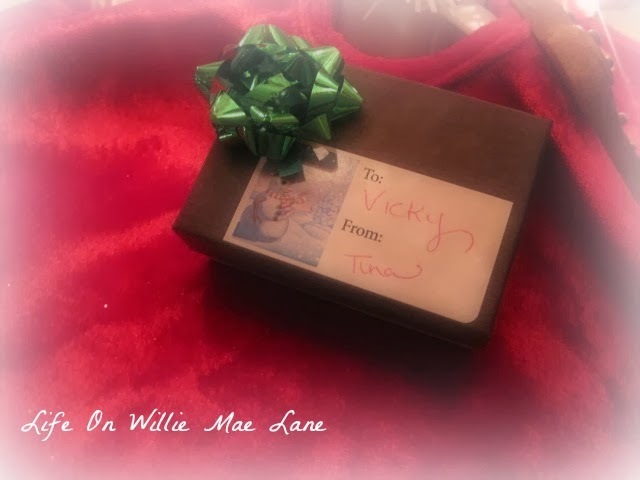 Thank you so much Tina for your kindness and generosity. 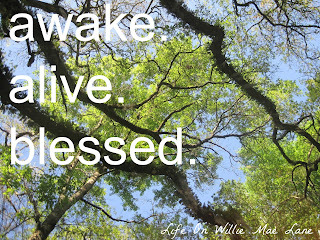 You are a blessing....as are all of my blog friends. I never dreamed I would make so many friends when I began this endeavor almost a year ago. December 31, 2012 was my first post and I am excited to be celebrating my one year anniversary soon. In honor of that, I am trying to come up with a unique giveaway idea.....so stay tuned so you won't miss out...:) I hope to have it up this week! Now, on a serious note, one of my best friends, Heather, (who is only 42 years old) was just diagnosed with stage 3 colon cancer. I won't go into specifics, but I would greatly appreciate your thoughts and prayers for this precious lady if she crosses your mind. 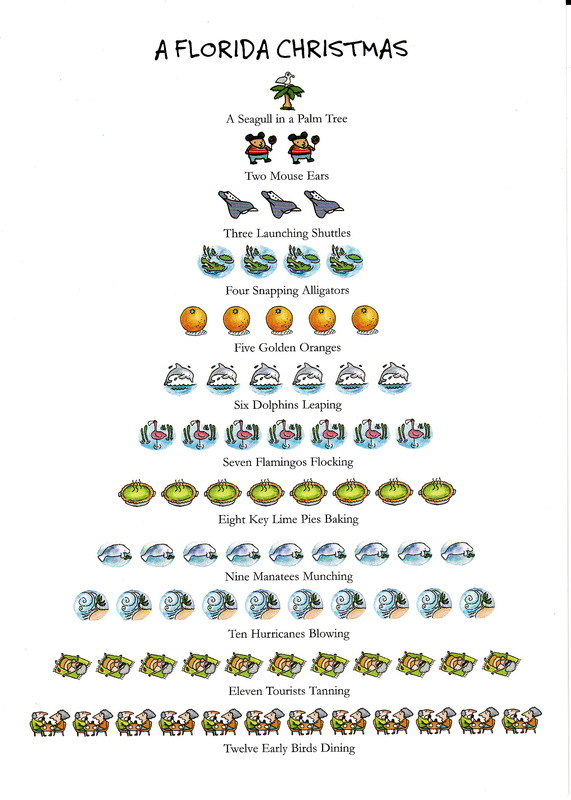 Wishing you the Merriest of Christmases from my house to yours! My prayer for you this Christmas day is that you will be surrounded with those you love, have an abundance of food, the warmth and comfort of home, and a spot in your heart for those who don't have these things. Where has this month gone? It's hard to believe I haven't had time to write a post since the 12th! Life has been a whirlwind for the past week, but I am happy to say it has now calmed down a bit. It was one of the hardest of my life concerning a couple different issues, but God is good and is answering my prayers and all is well for now....so on to the happy news! My daughter is going to be home either tomorrow night or Tuesday morning and will be here until sometime next weekend, so I thought I would spread some Christmas cheer around the guest room for her to enjoy during her stay. I hope you enjoy taking a peek around too! I used the traditional colors of Christmas...red and green as well as gold. I added several things to the windowsill. I love the vintage elves! I bought these earlier in the year at a thrift store or yard sale....I don't remember. Anywho, I got a great deal on them and discovered that they go for a good price on Etsy, so I put them in my inventory. But...since I have yet to open an Etsy store, I decided to use them this year! That's the great thing about vintage. I can use things until I get tired of them and then sell them for for just as much as I would have originally...:) My favorite elf is the one with the book....my Miranda is a bookworm! The basket of vintage bottles is so pretty with the red berries and spray of beads as well as the leaves I spray painted gold. I love the mosaic candle holder I thrifted a few years ago. I did have it in the living room, but since it is red, green, and gold, I nabbed it to place on the windowsill. I finally finished the tray I thrifted a few weeks ago. It was country blue with ducks and cats painted on it and wooden handles. 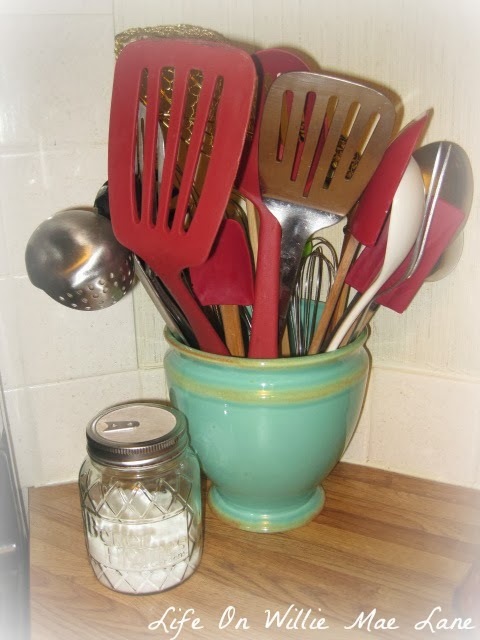 The hubby got rid of the wooden handles, I spray painted it gold , and he added the new glass handles for me. It is so pretty now. I added a Christmas tree jar, the bell jar, and a pretty cup...all thrifted at some point or another! Here's an overview of the room. I added white lights to the headboard. It is so pretty at night. 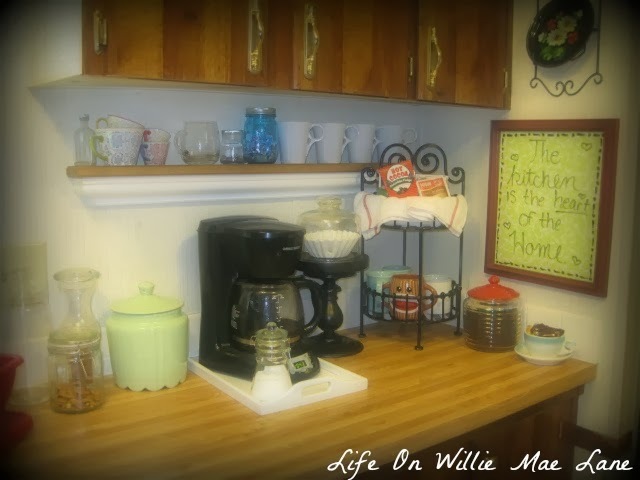 You can see the new glass knobs on the top dresser drawer in this photo. I added red flowers to the wall pocket on the left and I finally got my antique frame hung. For now I just backed it with some of my alphabet burlap and taped my vintage postcards to the front with some craft tape. Does it look ok? Please be honest! I had nowhere else to display them and thought they looked good in this room, but I'm not so sure this works. Here's the beautiful detailing on the frame. I am thinking of dry-brushing it white or gold so it will be more noticeable. What do you think? Which color should I use? The chest of drawers looks so pretty with the candlelight. I added a Christmas plate and a sweet little metal church. I added an ornament to the nest. I love this pretty gold glittered bottle brush tree I thrifted a couple years ago in Tallahassee. It goes nicely with the color scheme I chose for the room. I hope you enjoyed the tour. I have been busy all day cleaning house, decorating the guest room, and making lists of what I need to pick up tomorrow. I am praying I finish up tomorrow so I don't have to leave my house Christmas Eve until we go to my mom and dad's house for our family Christmas get together. 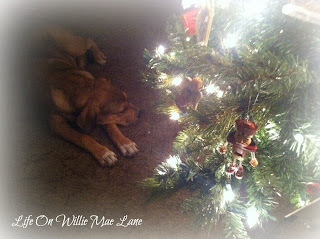 I am hoping to be back tomorrow with a post featuring my Christmas tree and some of my favorite ornaments, but in case I don't have time, I pray each of you have a blessed and beautiful Christmas. It's Time! 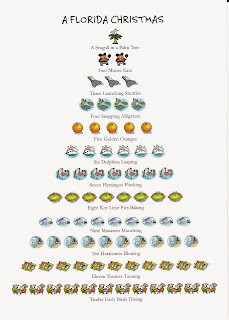 Time to Reveal Your Ornaments!